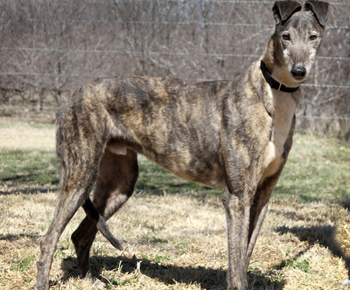 Woody, aka Bac's Trent S, is a 10-year-old brindle male born December, 10 2001. His sire is Coldwater Guv and his dam is Cajun Dazzle. 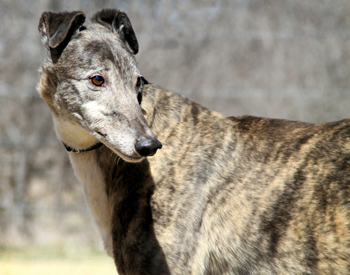 Woody has 37 races in Iowa to his credit on greyhound-data.com, starting on July 29, 2003, and ending on April 28, 2004. 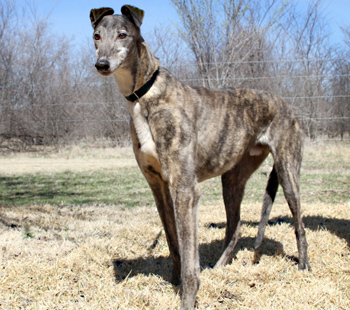 He's got a laid-back personality, and you won't soon forget his adorable fold-forward ears! Woody is not cat tolerant. Woody is a beautiful, super sweet, quiet dog. He is a little reserved at first, but once he trusts you, he enjoys being petted and leaning on you. He is the best greeter when you come in the door from work and in the mornings when he wakes up. He is happy but very controlled. Woody is quite the toy collector. He chews a little on them but mostly he just likes having 6 to 8 of them collected in his room. I rotate the items in the toy basket that he has to choose from. He has never grabbed anything of ours; he only chooses out of the basket or swoops in to grab our bulldog's toys when she sets them down for a moment. He LOVES going for a walk and is very well behaved even when we come upon rabbits on the trail. He knows what "leave it" means. He also loves to come to the barn with me and be around the horses. When I put on my riding boots he bounces around to let me know he wants to go. Woody has excellent house manners and whines when he needs to go outside. He sleeps soundly through the night, and is the king of naps during the day. I think he would do better with older kids than younger kids because he is sensitive to loud noises.